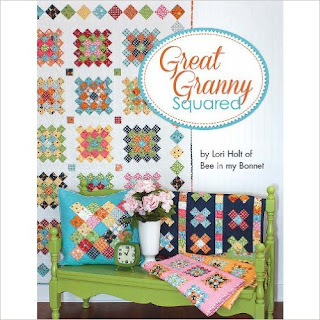 I have had the Great Granny Squared book by Lori Holt of Bee In My Bonnet since it was released. Super cute quilts,projects and fabrics that I can never resist thumbing through. many ideas started flowing for me. I began with the new Sweetwater Valentine inspired line called First Crush. In order to make a pouch, you need the book for cutting measurements. I chose 5 fabrics and cut out a block using 1.5" strips. The rest of the measurements were the same as a 1.5" great granny block. 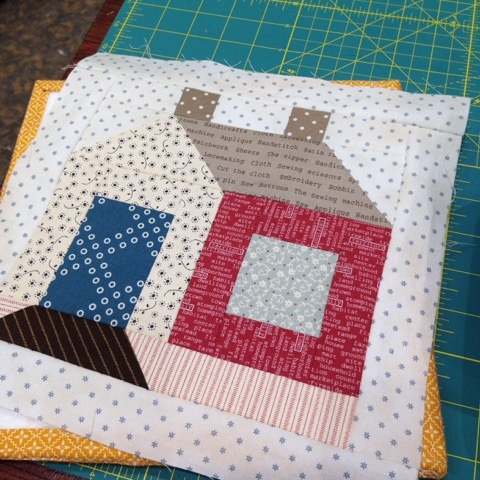 It measures about 9 1/4" square when sewn. I layered it with 10" backing and batting just as I would for a little quilt. 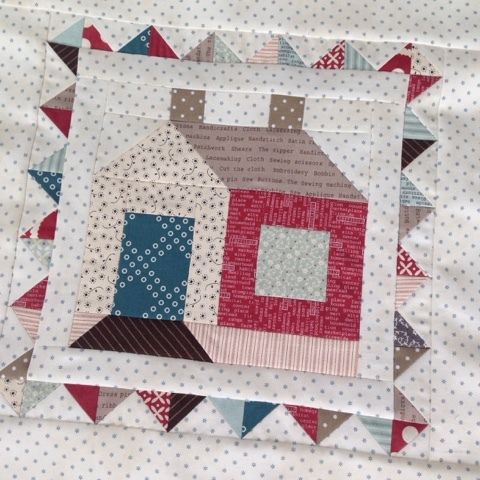 I quilted it with cross hatch straight lines using coordinating Aurifil thread. there was an inch of background fabric all the way around the block. It measures about 7" square. 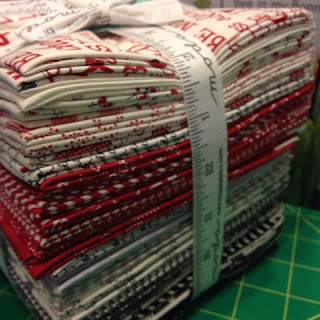 Remember this number can vary with the amount of quilting that is done. I cut out a 3/4" square from 2 sides of the block... opposite sides. I chose a zipper that was about 14" because I wanted red for this bag. The picture makes it look off but the zipper is connected on one end. I sewed the zipper to each 'long' side of the pouch. Turned it to the right side and top stitched the zipper in place. Actually using such a long zipper allowed me working room for sewing it on. Unfortunately, I didn't get many pictures of these steps. 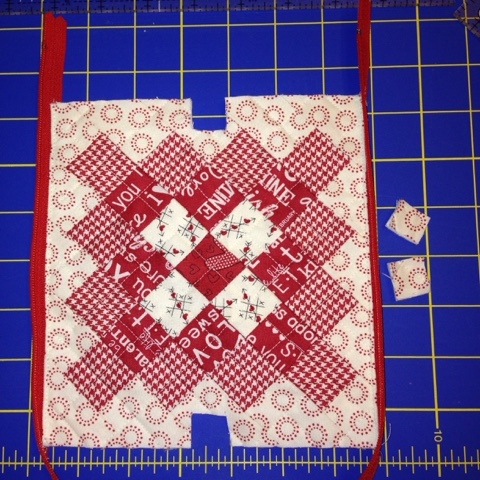 Next, match the sides of the bag - right sides together and pin from the zipper to the cut out out square area. 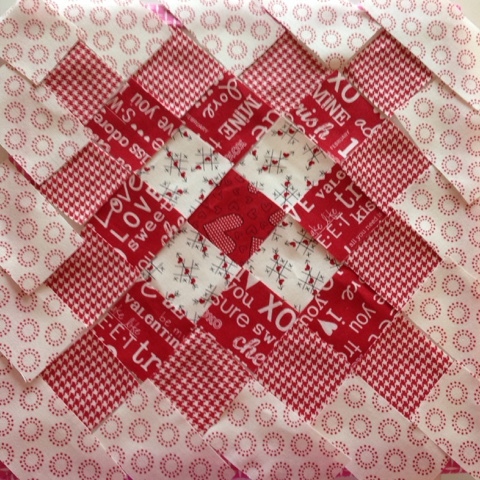 Then pinch open the 'square' bottom and fold it flat. Sew a 1/4" seam across. This creates the 'box' bottom of the pouch. Repeat for the other side BUT make sure your zipper is open half way. 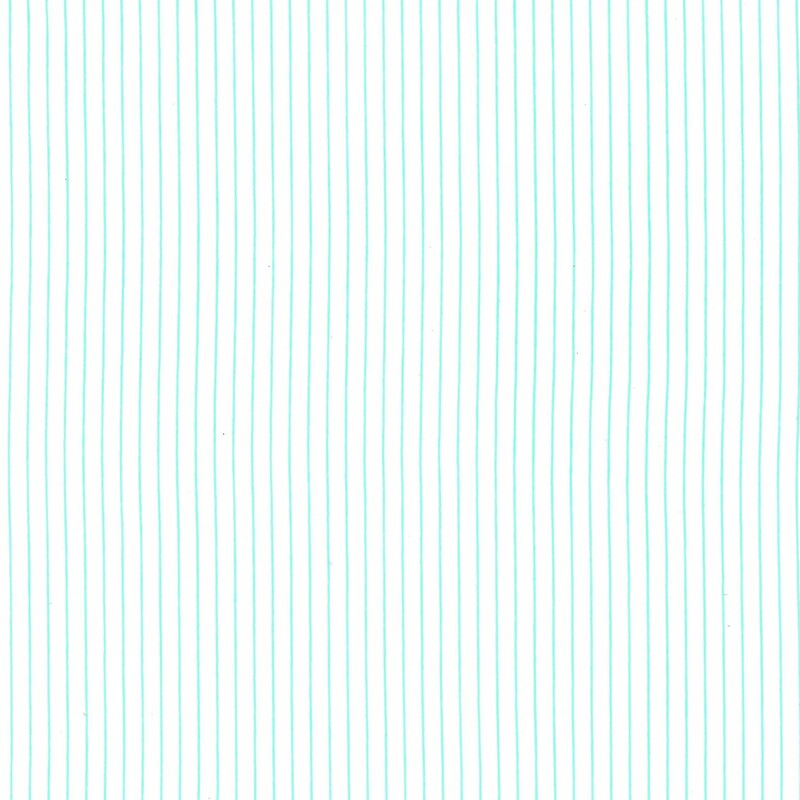 with 2" strips and 2 1/2" strips. This grey pouch used 2" strips and a mix of fabric from my etsy shop. a 1" square was cut from the sides of the pouch to 'box' it. Here is a large pouch done with Hello Darling mini charm squares. 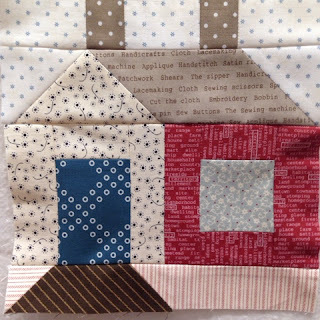 I auditioned the look of this bag by folding the block in half before I quilted. You can see the quilting is pretty basic - just straight lines. This quilted block squared up to 12 1/2". and they kicked it off with their twist called the Great Granny Circle. Here is the video on you tube for it. Super cool idea....wished I'd thought of it!! 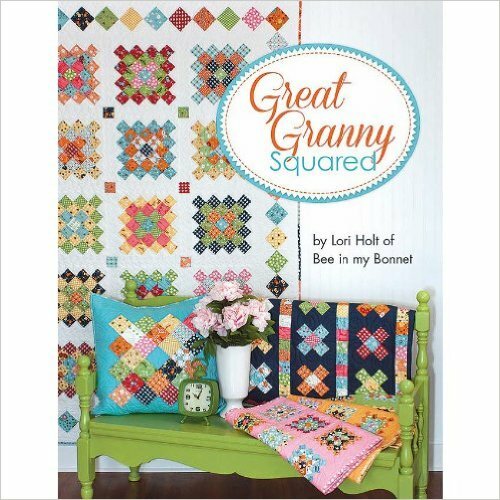 I hope that I have inspired you to make a bag or pouch from one of your granny square blocks! Here is the list of other bloggers that had Twisted fun with their Great Granny blocks. Again, I sincerely hope you enjoy the twisted blog tour. Just wanted to pass on that I am having a HUGE sale on my etsy site. All clearance is 50% off. Moda $3-6 and Japanese Yuwa is $8 a yard. 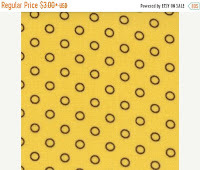 There are over 80 fabrics on clearance. 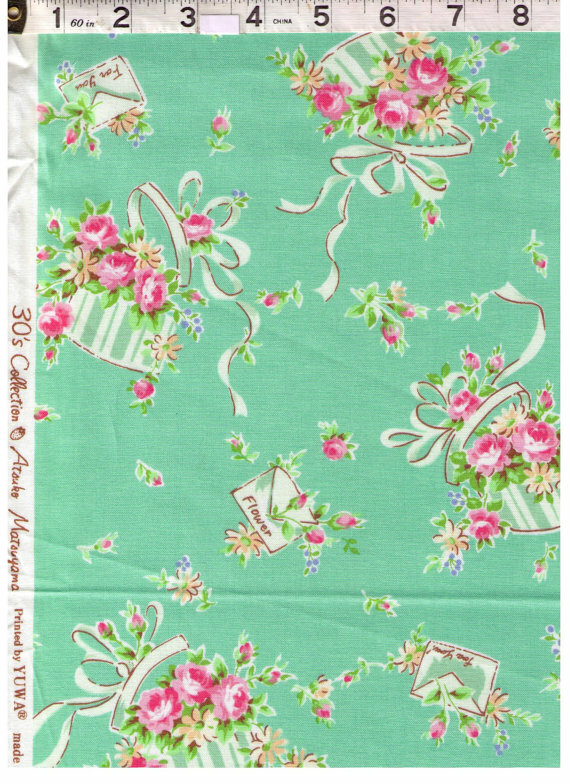 I have up to 30% off nearly everything else. I will be increasing the discount as it gets closer to the end of the year. for eventually going back to work outside the home. I am not closing...just scaling back the inventory so it is more manageable. You-tube videos for a couple of years now. I have, in fact, made several of the quilts and projects. 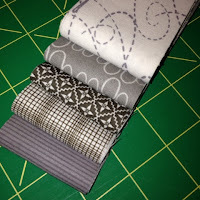 One of my favorite pre cut fabrics to use is the Jolly Bar. 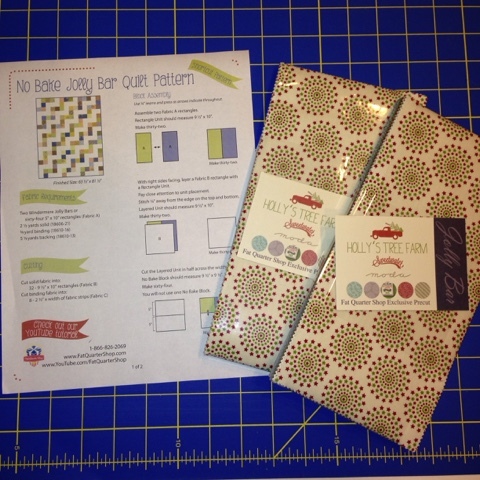 A Jolly Bar is a 5" x 10" cut only available at the Fat Quarter Shop. It's basically half of a layer cake. Sometimes I just want to sit and sew - having a cut like this provides variety to the projects that make without doing all the cutting ahead of time. It's a win win for me. I have talked about my mother in law on my blog in the past. 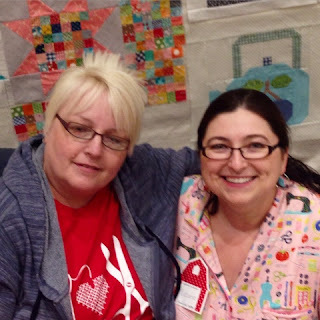 I pretty much got her in to quilting when I joined the family. and cutting fabric is difficult for her sometimes - okay all the time. when a precut fabric is a huge time saver for me. I have a lot less to cut. because this project was so close to Christmas and I really wanted another Christmasy quilt. I am in LOVE with the red ford pickups with a tree in the bed. 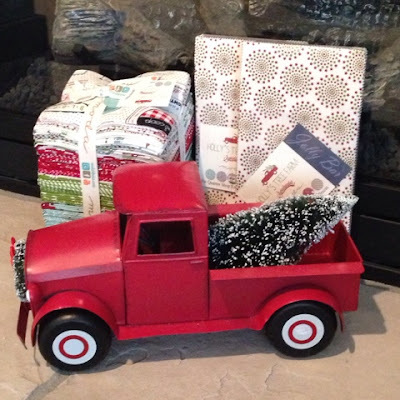 thank goodness for Target decor. 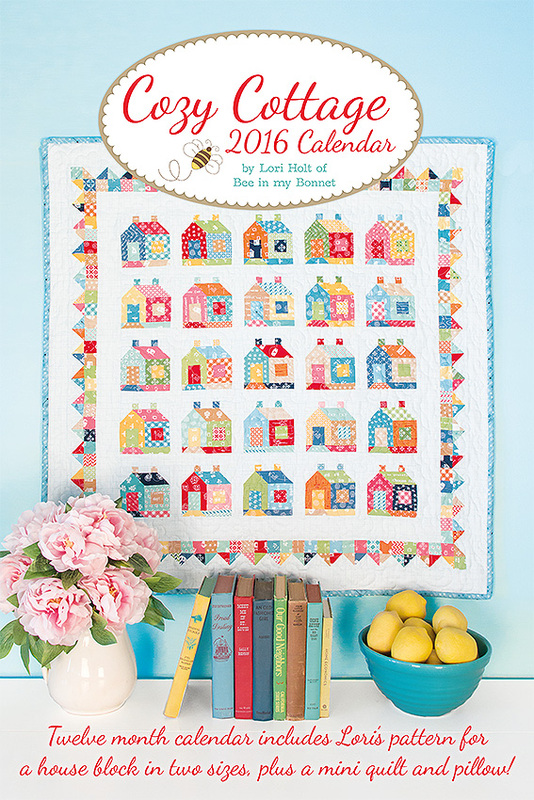 The free pattern from the Fat Quarter shop can be found HERE. Here is the video the Fat Quarter Shop made about this pattern. Here is my quilt top. Yep quilt top. 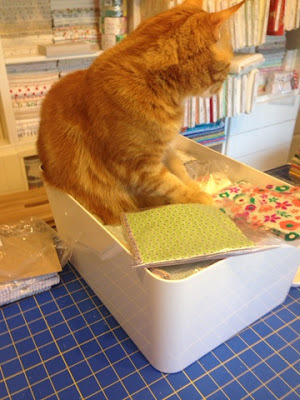 I always have great intentions to make, quilt and bind before a holiday but rarely finish. I have a 100 excuses and really it's okay. 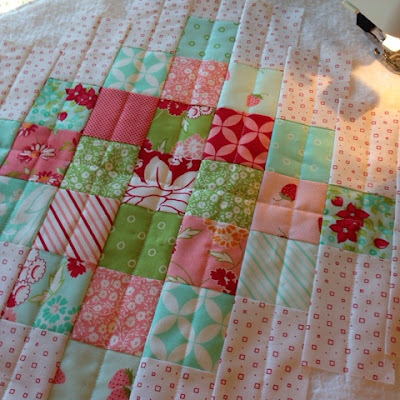 I will finish it because I love this quilt and fabric. It will probably be done by next Christmas - LOL. It's me. I am back to my blog today. and I end up just putting it on instagram. Today I decided - I will blog! Let me bring you up to speed on stuff. I have been making some secret -ish projects lately. The above fabric pull is what I used for one of them. Grey is not my go to color, in fact I had few grey fabrics and have been really trying to stash more. 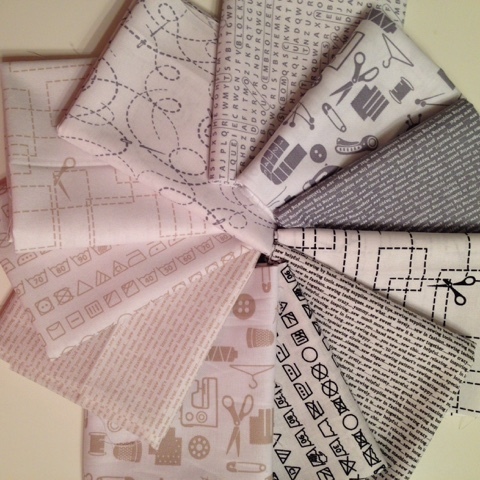 This fabric is the newest line from Studio E. I am completely smitten with it because of the sewing text prints, laundry symbol prints, sewing notions and the fact that they are low volume and there are greys! I just killed 2 birds with one stone. I have it listed on my etsy site and it's been quite popular. I am running a Black Friday week. There is 25-35% off everything in my etsy store including pre-orders. 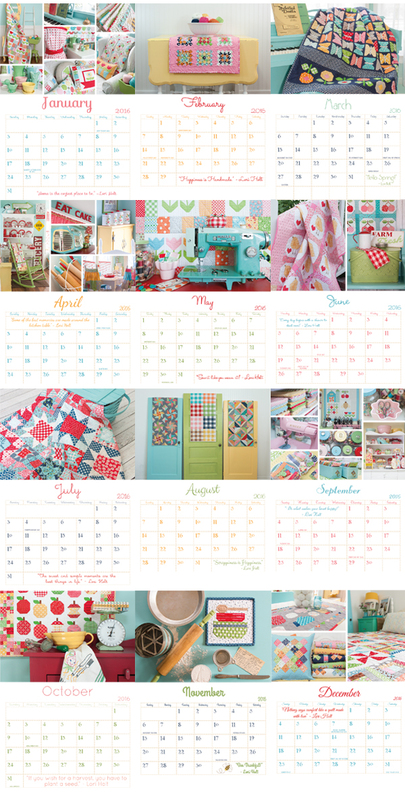 I am still taking pre-orders for Paperie which will arrive on 11/30/15 and ship that day or the next. 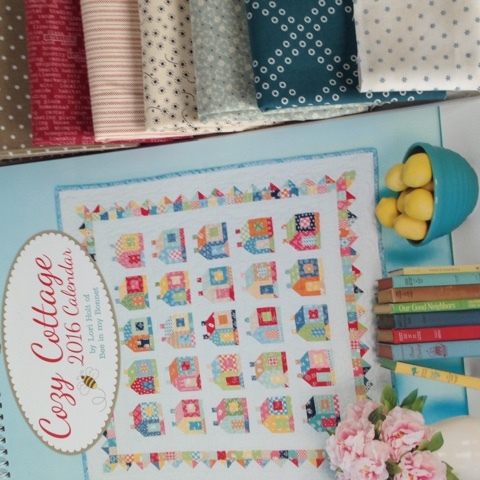 I am taking orders for Lori Holt's Calico Days and Bloom quilt along kits, all on sale this week. 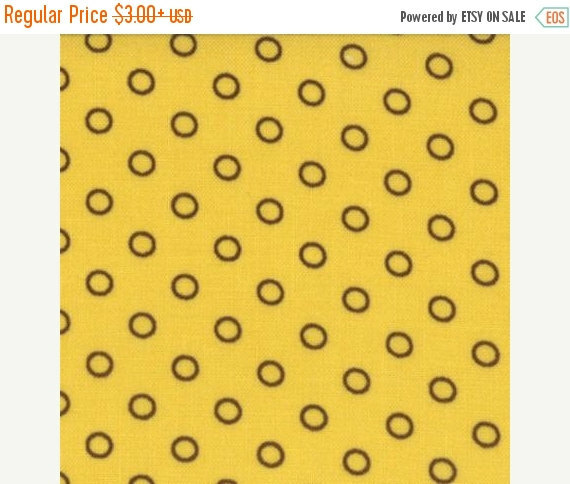 In addition to that, the newest moda sample spree fabric is coming and pre-orders are available - although they are selling fast. Again, WAY faster than I thought. 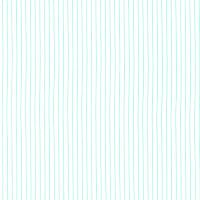 These are images from Instagram posts. Our cat Porkchop is enamored with fabric and small places to sit. 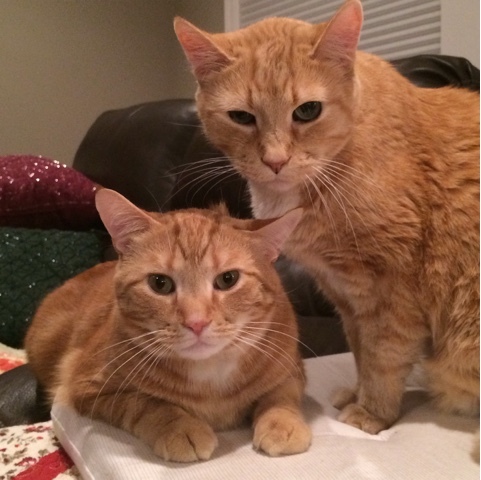 This is both of my cats in a rare photo when they are close but not having a battle royale. And lastly....I drank the kool-aid. 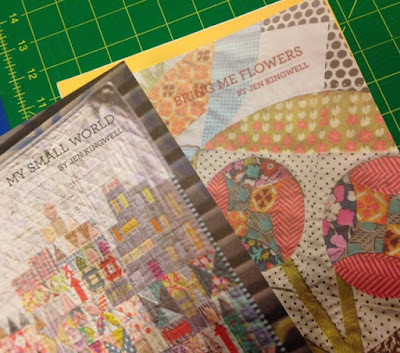 I bought My Small World and Bring me Flowers by Jen Kingwell. I bought them, I have no idea when I think I will have time to make them...but they are beautiful. Happy Thanksgiving in case I forget to post tomorrow. 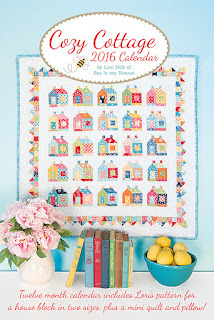 As you may know, Lori Holt of Bee in my Bonnet has a new calendar for 2016.
and pillows made from the calico cottage pattern found in the calendar. 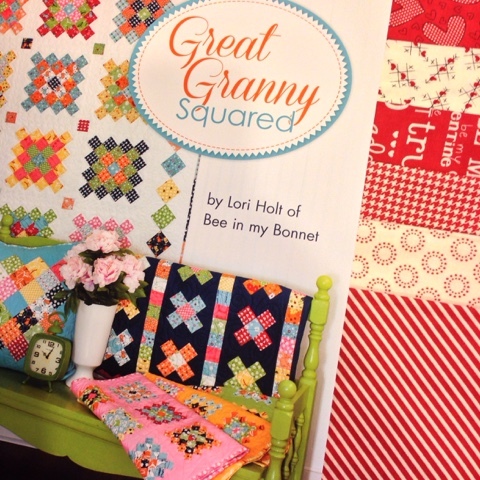 I LOVE LOVE LOVE the colors that Lori uses in all her quilts. They are happy fabrics. 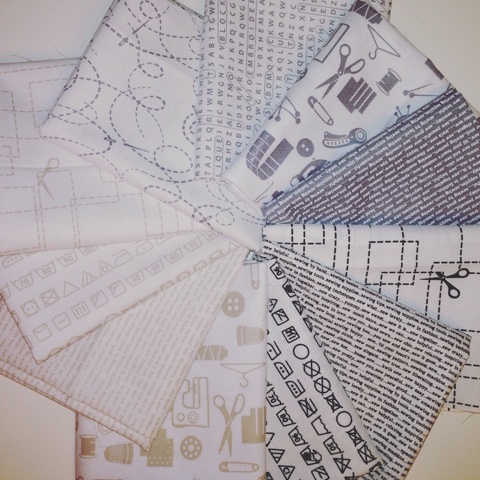 I possess hundreds of 'happy' fabrics. 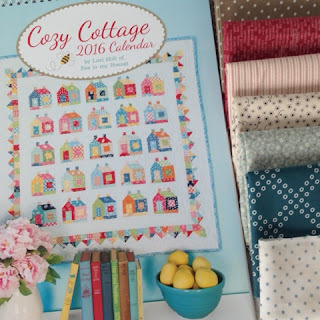 there's always a but, I wanted to make a cottage that reflects the color palette of my home. My husband likes dark wood, taupe and so forth, hence the main colors of my walls and wood work. Granted there is some off white trim however, the main theme is more green taupe brown. 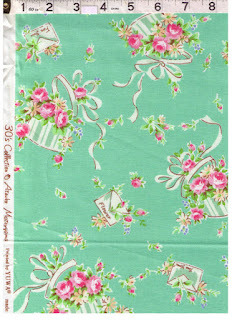 That is the inspiration I used for my fabric pull. I began sewing my cottage at the Thimble and Threads retreat in Draper, Utah last weekend. 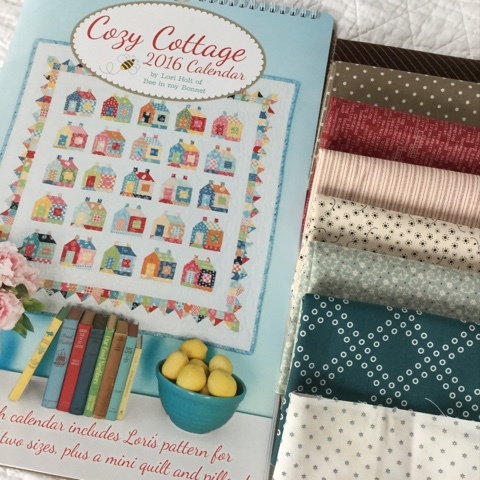 It was technically a Farmgirl Vintage Retreat but Thimble and Threads, to our surprise, gave each of us our own calendar to use during our open sewing evening on Friday night. This is Lori and I.
but it was fun to hang out and just sew at the retreat. 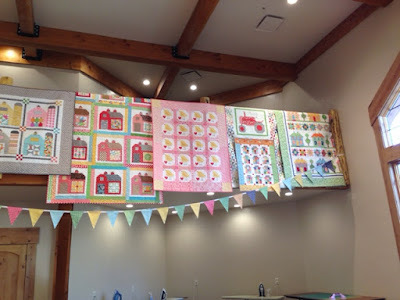 There are a few of her quilts. I wanted to make the pillow from the 8" block so that we can use it on our dark brown leather couch...yes... dark brown. 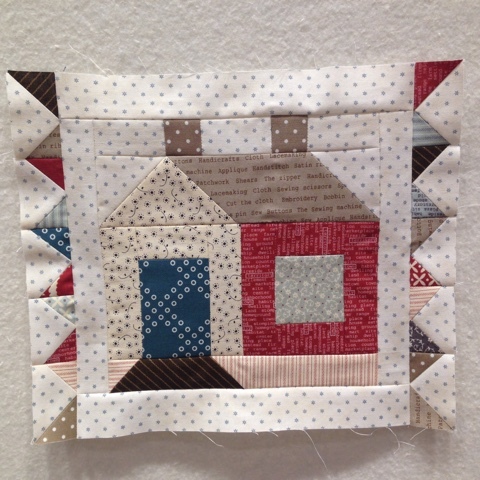 The block went together a whole lot easier than I imagined. 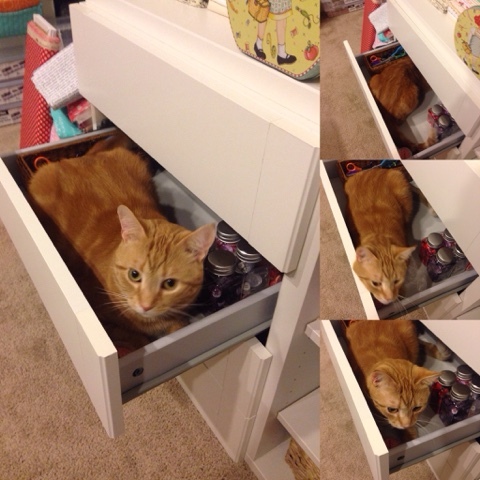 Seams fit perfectly. I actually want to try the 4" size now - well in brighter happier colors. You can find the calendars on sale on the Fat Quarter Shop site. Here are some of the inside images of the calendar. So my pillow isn't finished yet. Which is actually a story for a WHOLE other blog post.